On Monday, October 9, while students had the day off, all school and district staff were involved in a wide range of adult learning opportunities designed to ultimately benefit each student’s educational experience. In the morning keynote speech for K-8 teachers and instructional staff, Joyce Dorado, co-founder and director of UCSF HEARTS Program: Healthy Environments and Response to Trauma in Schools, spoke to a packed auditorium at King Middle School about strategies to create resilient students and a safe environment at school. Explaining the neurobiology behind the effects of chronic stress and trauma, Dr. Dorado encouraged teachers to build compassion with students and honor the strength in each other. She emphasized the importance of modeling self-regulation strategies in the classroom and in the school community that will help students who’ve experienced trauma gain more access to learning in the classroom. 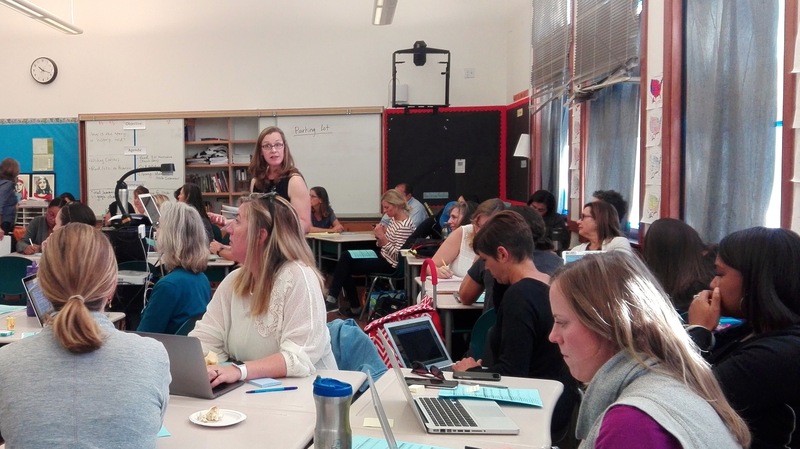 In subsequent break-out workshops led by BUSD teacher leaders, coaches, and educators, teachers and staff explored the many aspects of facilitating social emotional learning as well as best practices for full inclusion of students with disabilities. In one such workshop, BUSD Special Education Teacher on Special Assignment Julie Venuto introduced the framework of the Universal Design for Learning (UDL) that uses research from neuroscience to help teachers plan curriculum and instruction in ways that promote inclusion of students with disabilities and remove barriers to learning. According to Venuto, the goal of UDL is to utilize strategies that allow for flexibility in the learning environment while keeping expectations high for all students. She shared that in a classroom where UDL tools are being used, students have a variety of methods to demonstrate their understanding or a developing skill. They could use technology for reading and writing, create projects on a specific topic, and/or use tools (checklists, rubrics, visual schedules) to help them monitor their own progress towards a learning goal. One great website to learn more about the UDL framework is http://www.udlcenter.org/. Continuing with a focus on social-emotional learning, school safety officers, family engagement staff, and other classified staff members attended workshops on health, safety, and how best to support students experiencing trauma. For a range of classified staff, including school secretaries, “PD Day” made it possible for them to focus on learning their way around the Illuminate Student Information portal that they now use every day for grades, attendance, data, and other information management tasks. Six weeks into the school year, this early fall Professional Development Day is well-timed to ensure that all district employees have dedicated time to focus on their own learning and skill development.